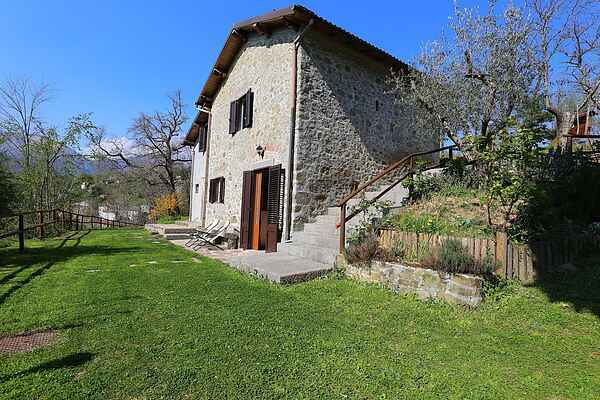 Charming detached house in Lucca province. The holiday home is an accurate restoration of a traditional Tuscan home. Set in the verdant, rolling Lucca hills, it is furnished in a comfortable and traditional way. The garden and terrace, (exclusive) offer beautiful views. The living area is across 3 levels: basement, mezzanine and loft. The position and context make it an ideal base for fans of peace and tranquillity. Furthermore this holiday home boasts a central location, and offers easy access to many of the regions top destinations: Lucca is 37 km away and Viareggio beach is just under an hour away by car; as is Florence. Casoli is a small medieval village set 560 metres hig in the beautiful, gren and stll unspoilt valley of Lima river ofering breathtaking views of the surrounding mountains. The climate is mild whit an annual average temperature of around 13c, with a peak of 30c in summer and a low of around 5-6c in december/january. As far as vegetation and fauna are concerned, it can be said that here, like in all anciently populated areas, the work of a centturies. Old civilisation has left deep trales of change to the flora and fauna. The small village of Casoli is sourraundid of beautiful and green scenery is ideality place for the person who like wolk in the wood of chestnut, where is possible heet rue deer,wild boar, hawk...., and the person who like a vacantion of relax.